A video message that is easy to find and easy to view will be more successful than one buried in the depths of one, two, three clicks away. When you put a company message from the CxO or a status update from a project leader—front and center where employees and team members are—the information and insights will be better targeted, more fully understood and ultimately shared within the right context. Learn more about how to embed a video to your online or on-premises SharePoint Team Site from Office 365 Video. Let’s dive into three key scenarios where embedding videos improves corporate communications. SharePoint Team Sites—SharePoint Team Sites are a place for working together with a group of people. They are great destinations to emphasize your brand and information out to your peers throughout the organization. They are central locations to manage content and information, sharing internally and externally to work in rhythm across the collective group of people you work with. As you continue to share documents, team notes, project timeline information and lists of data—so, too, can you easily place important video communications within the primary experience of a team site. 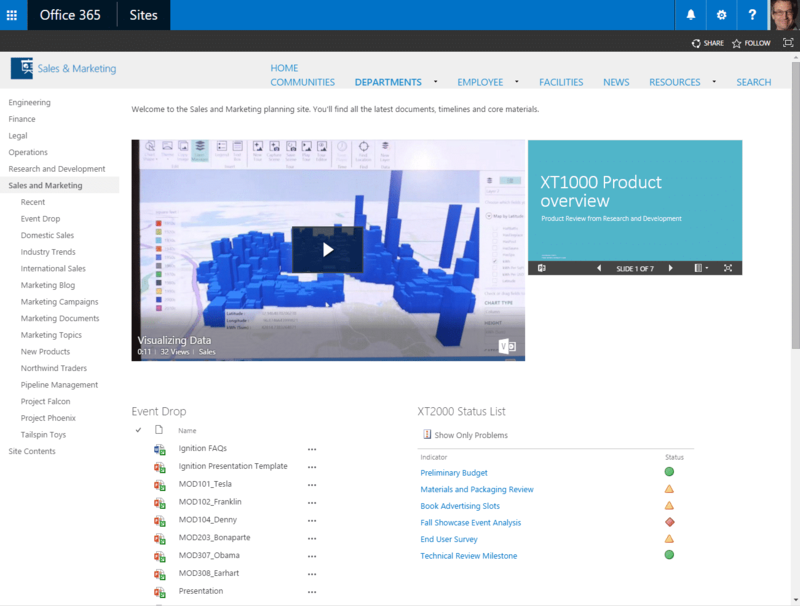 SharePoint Team Site showing an embedded video among an embedded PowerPoint, a document library, a KPI web part, plus navigation to other sites and subsites. The company portal—An important part of the modern intranet is enabling companies to build their own custom portals and sub-portals (company intranet sites) that support search, custom design and navigation and business solutions on-premises and online. Here, too, it is critical for important, company-wide video messages—like a quarterly earnings report from the CFO—to be accessible; not a link to a video, but right there, playable on the home page where the eyeballs are and the desired action lives. An embedded video within a custom portal home page, side-by-side with news and announcements, custom navigation elements and custom design. Internal blog post—Blog what you want to say and do it in a modern way. That is the mantra of the new authoring canvas within the Office Delve profile experience. And spice up your posts with multimedia elements, including video, like a trip report; it’s easy! And because it’s integrated across Office 365, you can embed videos from the Office 365 Video portal—with inline playback—in seconds. A video embedded within an internal blog post (rendered from a tablet device). Video plays back inline within the post, and can go full screen. With Office 365 Video you can take video beyond the portal. As you begin to embed videos onto team sites, portals and blogs, take advantage of the many ways to share video beyond the Office 365 Video portal and land your message to your intended audience. Share via email; post to Yammer; search and discover with Delve; make videos available on the go, accessible throughout your intranet—where users are active, engaged and ready to consume your information. Embed today, increase your reach and be heard!